Aldi Novel Adilang, an Indonesian teenager, survived 49 days adrift in the Pacific Ocean. 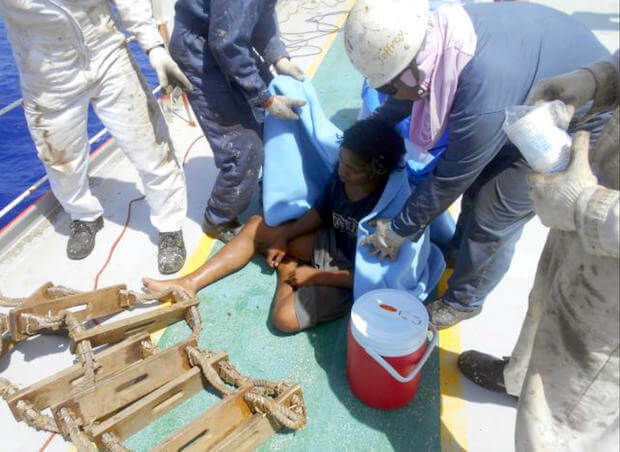 The 19-year-old had been working alone on a "rompong" - a wooden raft used to trap fish. In July, a storm broke the rope attaching the vessel to the sea floor, leaving Adilang to drift out at sea for seven weeks. Within one week, he ran out of stored food and survived by catching and cooking fish, using the wood from the raft to do so. He filtered ocean water through his clothes to stay hydrated. Adilang passed more than 10 ships, each time lighting a lamp on his rope in hopes of being rescued, but all of the ships passed without noticing the raft. Finally, after he traveled more than 1,200 miles from Indonesia to Guam, Adilang was able to send an emergency signal using a hand held radio, and he was rescued. Mirza Nurhidayat, the Indonesian consul general, stated, "Aldi’s story is indeed dramatic, and we are thankful to all that have been very helpful in ensuring Aldi’s return."